Yesterday I made the first of my visits to the artists who will be exhibiting in this year’s Lexden Arts Festival (2nd – 9th May). 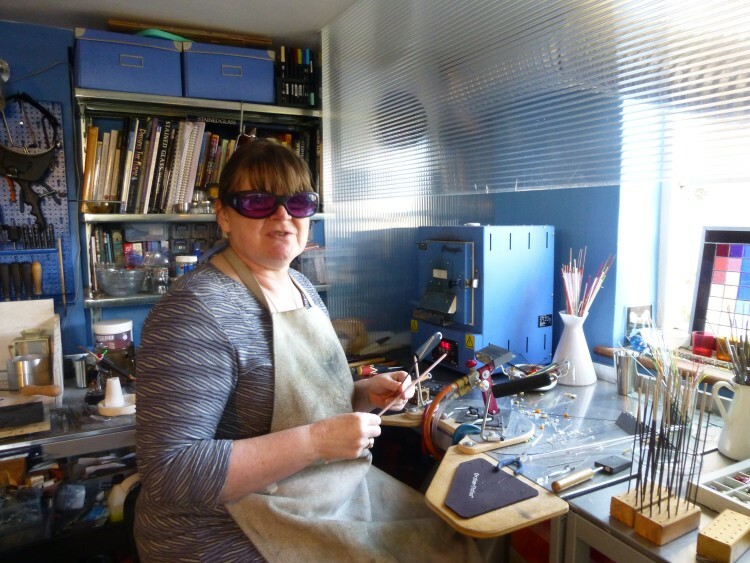 I drove out to Leavenheath to visit the studio workshop of Cathy Allen, a lampwork bead maker and silversmith. Over a very welcome cup of coffee, Cathy showed me all the fascinating tools she uses for her work: various different flame torches, a kiln, rods of beautiful coloured glass, strands of fine metal, a gadget rather like a pasta rolling machine for adding texture to silver . . . an enormous variety of different tools and materials. Cathy’s beautiful lampwork glass bead necklaces, bracelets and ear-rings are made in all colours of glass, from muted, natural colours, to really vivid shades. I was given protective glasses to wear, to protect my eyes from the intense light from the torch flame, and then Cathy showed me how each bead is made individually on a stick coated in a ‘bead release’ substance, with molten glass being twisted around in the glowing hot flame. Decoration can then be added to the bead when the shape is complete – Cathy showed me beads that had a trail of silver around them, or tiny spirals. Once it is complete and decorated each bead then has to be held at temperature in the kiln, for a number of hours, before it is very slowly cooled to prevent it cracking. Cathy cleans out the threading hole, where vestiges of the release substance remain, and usually then etches the surface by immersion in an etching solution to give the bead a beautiful matt finish. ← And another new painting! Wow, perfect. Fortunately, I found your website! Thanks for sharing!